You could say this whole project started because of jealousy. Of a need, really, to get back behind the wheel of something with seven grille slots, four-wheel drive, and 'Since 1941' stamped right there on the glove box handle. It had been awhile. See, I bought my first Jeep right after college - a 1991 YJ that served well for a number of years before giving way to something more fuel efficient. Several years later came a '99 TJ that reaffirmed the joy of driving a Jeep, but when kids arrived it was sadly time, again, to find something more economical. Time passes, kids grow up a bit, and then there comes a slightly chilly, but definitely rainy South Philadelphia night last November. Several of us are helping out at the Preston&Steve Camp Out For Hunger event, trying to load as much food into a hundred-plus Jeeps as we can. I'm one of the non-Jeeps in the lot, as my jet black Kia Forte shamefully tries to hide in one of the corner spots. It was at that point, surrounded by some of the area's best Jeep vehicles, that the Kia and I both knew it was over. The jealousy was too strong. The hunt began almost the next day, as needs vs. wants were mapped out and a plan began to take shape. I knew a new '16 or '17 was out of the picture as even the entry level Wrangler Unlimited price tags were pushing mid-$30s. But I did want to keep the range restricted to a '12 or newer simply because of the 3.6L Pentastar. This vehicle will be a daily driver, as well as an off-road rig so the additional horsepower and torque will come in handy. It also needed to be an Unlimited as the kids, while older now, would be easier served by having their own doors rather than pushing past a seat to get in a 2-door every day. Vehicle mileage wasn't a tremendous issue, but obviously the lower the better. Same with a hard or soft top. Either worked. After a month of searching through several different internet and printed sources, I found one local JKU that jumped out from the pack - something which seemed just a bit too good both in price and mileage. A battleship gray 2014 with less than 22k miles and an unbeatable sticker. So much so that I almost dismissed the offer, but after giving it a closer look I'm glad I didn't. When people say deals are out there, you just need to look hard enough - they are right. This one checked out with a slight ding in the tailgate but an almost spotless engine bay and very little other wear and tear. The only noticeable addition by whomever traded it in, was a 2.5" Teraflex Budget Boost kit and in retrospect, maybe this scared off other potential buyers. 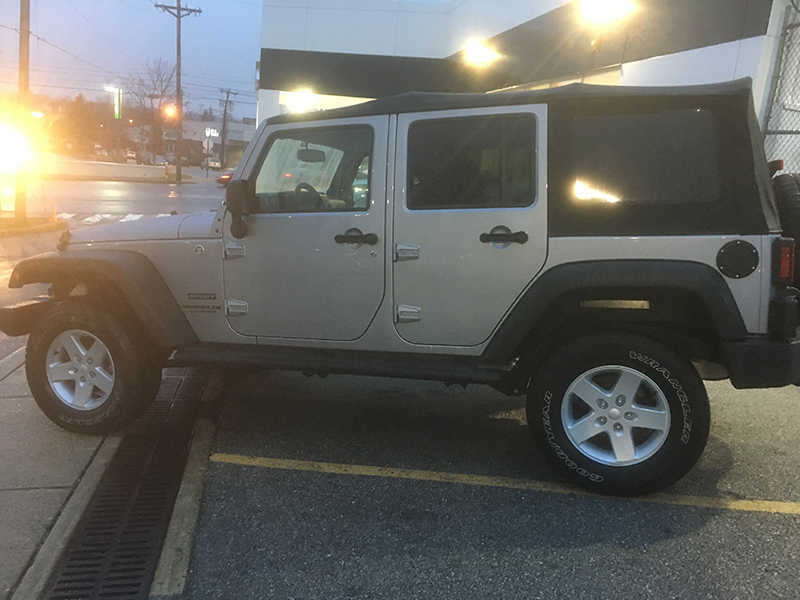 I'll probably change that out down the line, but for now - with the new (to me) Jeep Unlimited in tow - we're going to go over several different ways to keep 'Grey Wolf' daily-driver friendly, while also profiling some great additions to provide off-road strength, protection and capability. This is a category I think most Jeep owners fall under, and perhaps one some are in who don't realize they can still daily drive, while enjoying a weekend trip off-pavement with just a few improvements. Quality of life improvements on your Jeep are probably the easiest and quickest things you can do to add to the vehicle's look, while also providing some service and protection. 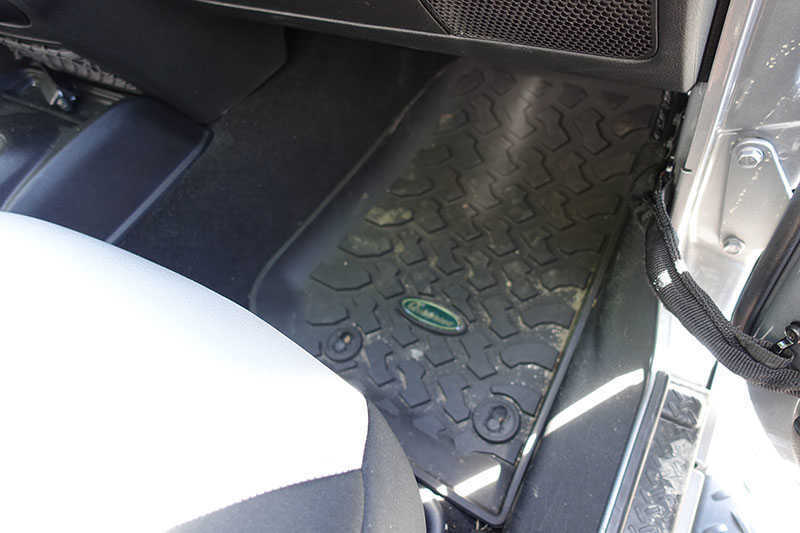 For this build, one of the first things we did was to remove the slightly worn Jeep carpeted floor mats and replace with Quadratec's Ultimate All Weather liners. We will be in and out of the vehicle all the time, so these mats are super easy to pull out, hose off, and re-install. The thick rubber means the liners won't wear down like carpet, while the deep treads will capture water, mud, snow, soda - whatever we happen to drag into the vehicle or spill. Plus, with two kids, the rear liners protect against anything they happen to drop that would normally stain or ruin other liners. Speaking of kids, as the vehicle came with a 2.5" Teraflex Budget Boost kit, we wanted to make it a bit simpler for them to hop into their seats, so we installed front and rear Quadratec neoprene grab handles. The fronts install easily with velcro and have not loosened at all despite some very hard pulls to test strength. The rear handles install nearly as easily - you just need a 10mm socket to pull the bolts out on the left and right hand side of the soundbar, hold up each edge of the handle, and re-seat the bolts. If you have young ones, and any type of lift on the Jeep, these type of handles definitely make life simple for them. 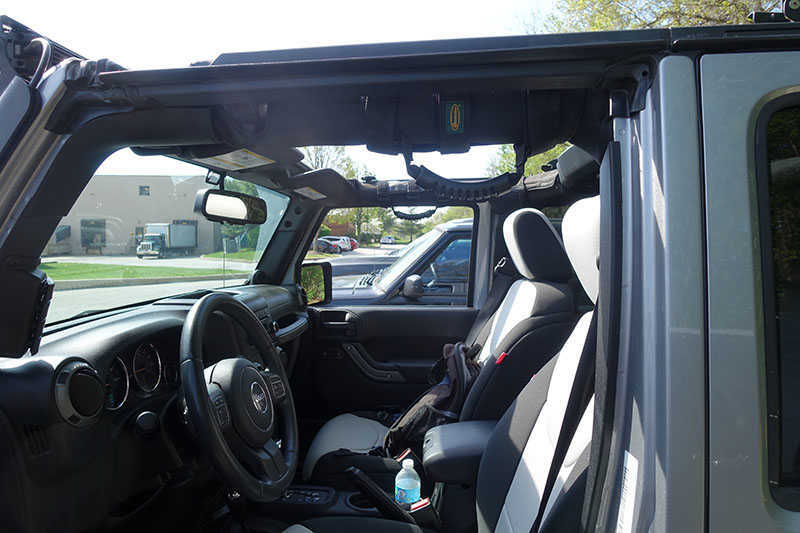 While getting in and out of the Jeep is easier with Neoprene Grab Handles, and Ultimate Floor Liners protect the inside when doing so, the vehicle's unprotected lower door sill can take a beating over time from all that action. Luckily, this '14 still looked pretty decent in the door area. To keep it that way, we added front and rear Quadratec Entry Guards. 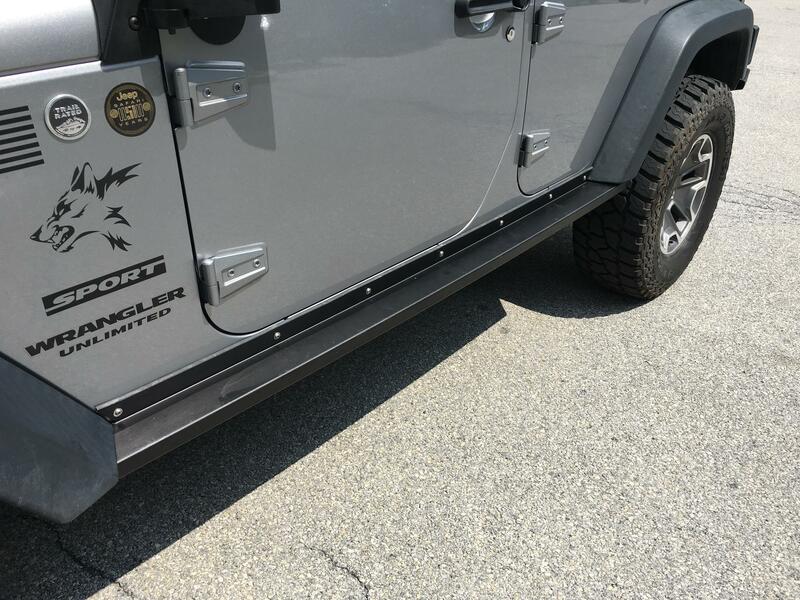 These injection molded guards attach easily with 3M adhesive and are cut specifically for the Jeep's lower door sill size. Simply pull the protective covering off the adhesive and press the liners to the lower door sill. These entry guards even come with alcohol wipes should you wish to clean the area first before installing. 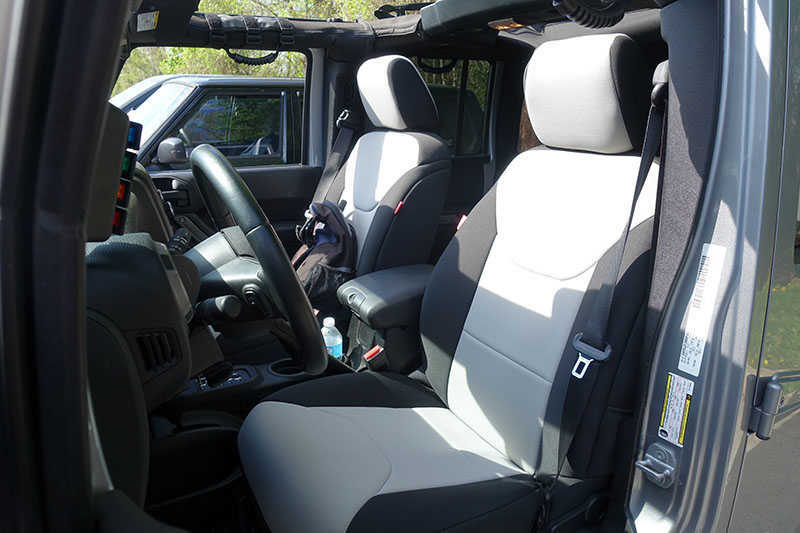 Finally, we wanted to add some protection and a different look to the Jeep's seats. While nothing was wrong with them as far as we could tell, the seats in our old '99 TJ used to take a beating over the summer when the top was off and had to be replaced several times. So installing some front and rear Diver Down Neoprene seat covers, no tools required, gives us security against water, dirt, mud, or whatever the kids may spill, while also providing the ability to customize a color look thanks to a variety of available patterns. Plus, you can't beat neoprene for that soft feel which stays cool in the summer and warm in the winter. With its four-wheel drive, low gearing and large clearance capability, a great benefit of Jeep ownership is the overall sense of safety the vehicle provides. However, when it comes to bumpers, things usually take a sideways turn for most. And Grey Wolf was no exception. As a sport model, it arrived with lightweight front and rear bumpers which, as others have found here, really offers no protection should you scrape against something either on or off road. In the Rubicon edition, Jeep saw fit to give its owners nice protective steel bumpers starting in 2013, but those of us with Sport and Sahara versions were left to fend for ourselves. So, what to do? Because I want this vehicle to be a capable off-road rig, as well as a daily driver, I started looking at aftermarket bumper solutions that would have strength as well as functionality for auxiliary lighting, winches and tow points in the front, while providing additional lighting and tow points in the rear with the ability to co-exist with a tire carrier. And all this without adding a tremendous amount of weight. Yes, tremendous is the key word here as you can't avoid putting on some additional weight with heavy duty bumpers, especially with a winch in the mix, but you can choose options that allow you to find the right weight combination for your needs. Bumpers such as full-on modular types to smaller stubby ones that all have different heft when installed. I also wanted to keep in mind the types of off-road terrain I'll normally see when choosing a bumper. For my area, it is mainly rock with some brush depending on the trail, and because I've always liked that more compact bumper look I decided on the Teraflex Front Epic Bumper with Hoop. 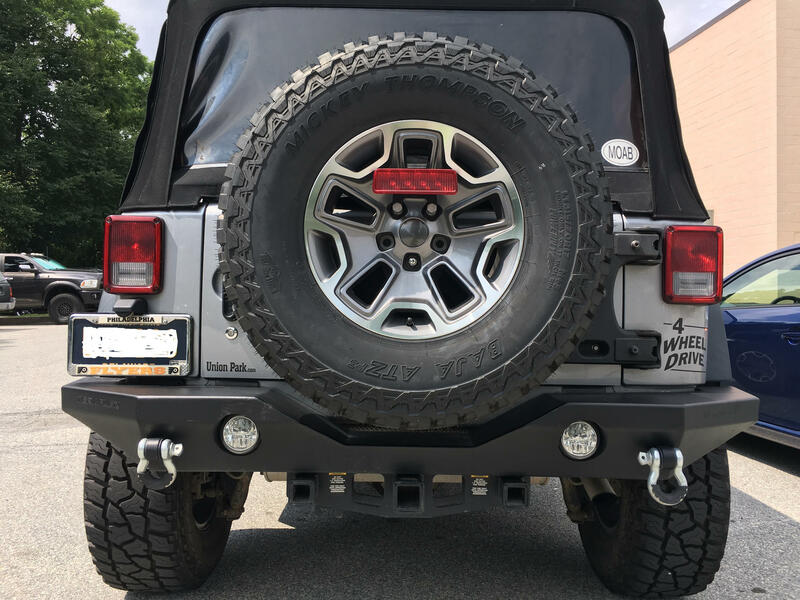 This bumper has a recessed winch mount to help keep the radiator clear for maximum cooling, while offering two D-ring mount points, a hawse fairlead opening, factory fog light sized openings, and an angled bull bar. Plus, this bumper weighs less than other heavy-duty bumpers and offers unobstructed approach access to obstacles for my tires. Of course, your mileage may vary and there are many who prefer other full-size bumpers. But for me, this one had the features, strength, and look I wanted. I've found over the years, from my own experience and customer feedback, that Teraflex's quality is outstanding and I have no worry it can take on any mistake I make while out on those rocky trails. So in looking at rear bumpers, I quickly found the Teraflex Rear RockGuard Outback Bumper with Fog Light Cutouts not only meshed well with the JK's rear for appearance, but had the tow point mounts I wanted as well as auxiliary light openings - which I plan to pair with LED reverse lights. Plus, the rear bumper has a recessed spare tire well that allows for easy tailgate access even with the 35" Mickey Thompson ATZP3 spare tire. As an added bonus, the bumper's top edge is wide enough to use as a step - which provides a great way to access roof cargo storage racks. Speaking of the spare tire, we all know getting it off the factory hinge is imperative when upgrading tire size. I've had experience with some though where you have to unhook a bolt before you can open the tailgate which is frustrating. 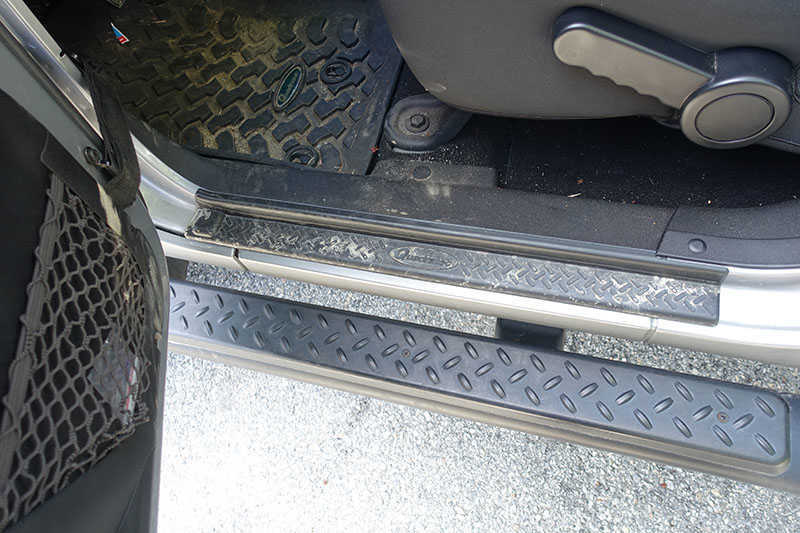 So Teraflex's Hinged Carrier & Adjustable Spare Tire Mounting Kit looked to be a nice option. 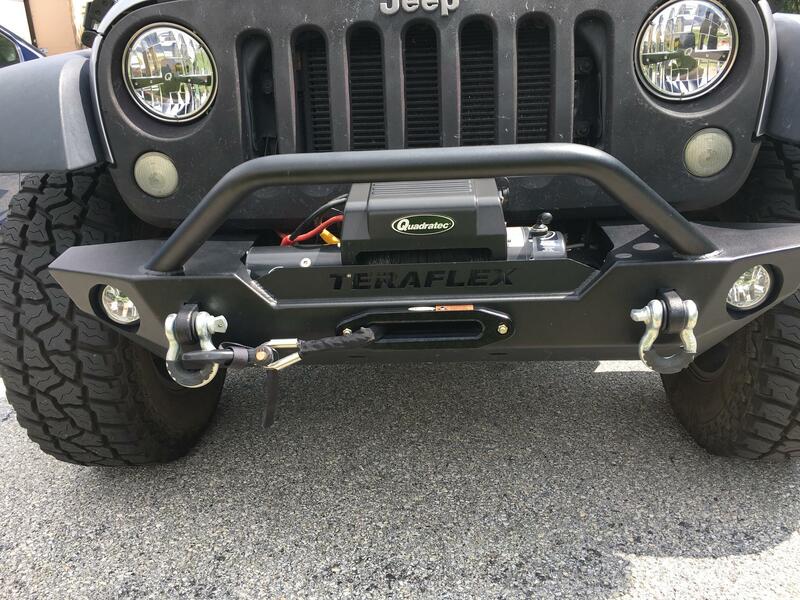 While this heavy duty tire carrier works great with the Teraflex bumper, it is also adjustable thanks to several vertical mounting holes which makes it compatible with just about every rear bumper on the market. It also employs forged hinges on the factory mounting spots which helps distribute weight evenly and keeps stress off that tailgate. Not to mention, the hinged design allows for easy access to the cargo area by just opening the tailgate - no need to unlatch or unhook anything before opening. Lastly, to upgrade Grey Wolf's side protection, I decided to remove the stock factory plastic side rails in favor of some Teraflex RockGuard Rock Sliders. These lightweight side guards are just about the same weight as the factory steps, but are made of extruded aluminum and are quite a bit more solid. They also do not extend out as far from the vehicle as those factory rails - which is a key component as many trails in my area are narrow with restricted access points to obstacles. In reality, there are plenty of solid rock rails out there - some with built in steps if you prefer - but this streamlined design fits what I had in mind for the build. With all these on the vehicle, I'm confident they will help erase any off-road mistakes I make, while I won't have to worry about replacing my tailgate down the line because of the larger spare tire. Lighting that cuts through the darkness like twin beams of justice. OK, maybe not quite like that. Maybe more like twin beams of safety, which is why I was determined to get some Quadratec LED Headlights and Quad LED Fog Lights on Grey Wolf as soon as possible. Because when you can see further at night, you can react quicker to whatever the road may throw at you - and I do quite a bit of night driving. Plus, we'll also be attending our fair share of night ride trail events, so this powerful and affordable lighting will be perfect. Besides these replacements, I also wanted one of our new J5 51" LED Light Bars. It is definitely not for additional on-road lighting, but it will absolutely help out on those night trail rides. Now this isn't to say that those stock halogen headlights and fog lights do not work. Given a choice between total darkness and halogen, then halogen wins. But take a flashlight into a pitch dark basement and you can make out where you are going. Then turn on the light switch and you can see everything. With LED lighting, you can pretty much see everything down the road. 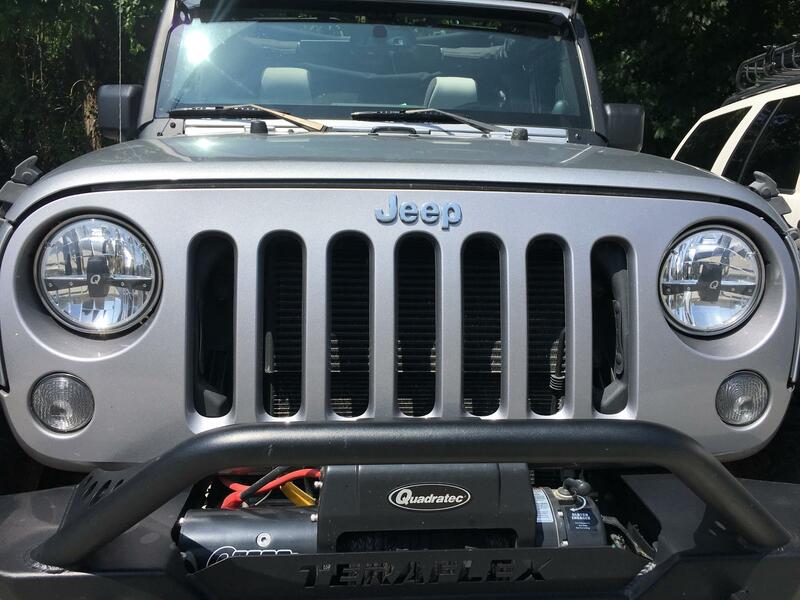 So much so that even Jeep has learned this as well, and is currently offering LED as head and fog light options for some 2017 Wrangler models, while making it standard for all 2018 JL Wranglers. 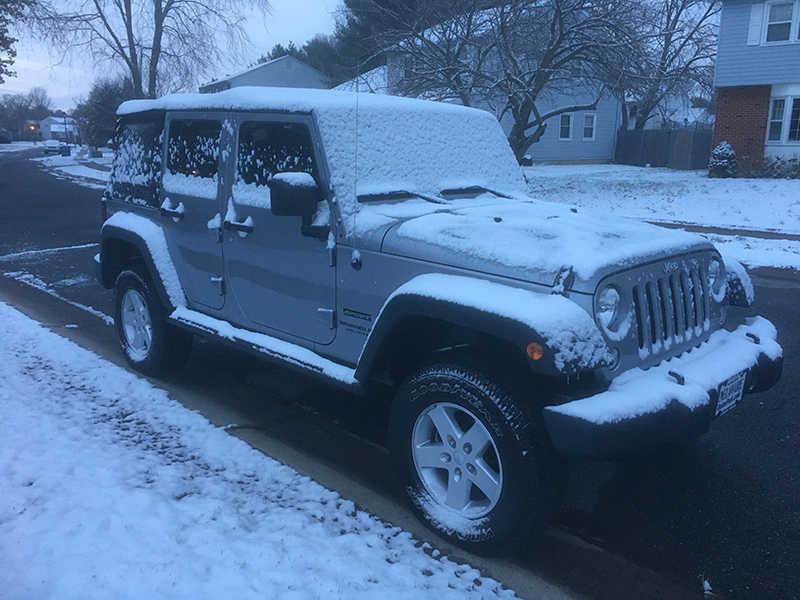 So if you are still on the fence about swapping out your halogen headlights, take a trip to your local dealership some evening and look at one of the Sahara or Rubicon 2017 editions. Hit that headlight switch and watch the night turn into daylight. Seriously. 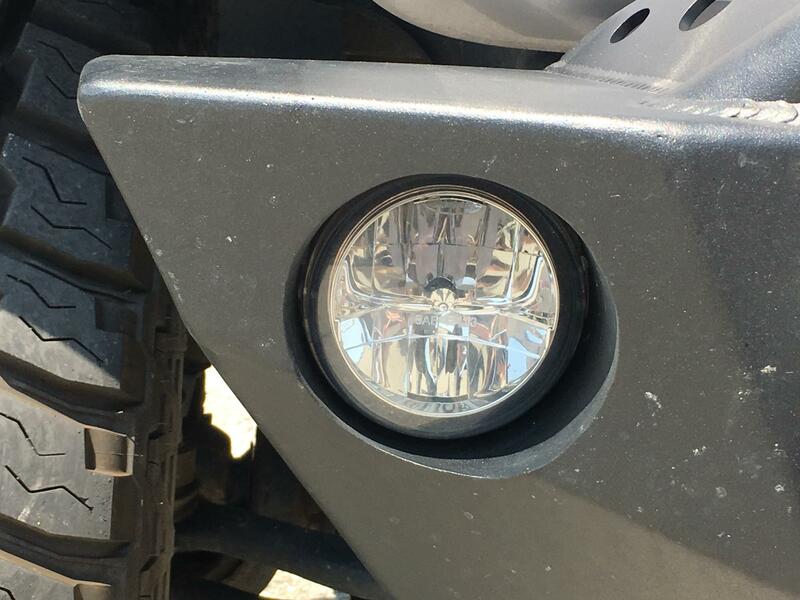 Just about everyone here at Quadratec has at least a set of LED headlights on their vehicle and when I saw a set light up for the first time, well, I was sold. While these lights are more than just numbers on a chart, here are a few that can put it into perspective a bit. The average H13 halogen headlight bulb produces around 404 lumens of light at low beam. That is roughly equal to a 40 watt light bulb you may have lying around the house. Now, for those interested, automobile companies measure headlight power in lumens instead of watts, as lumens are basically a measure of a bulb's brightness vs. wattage which measures energy output. 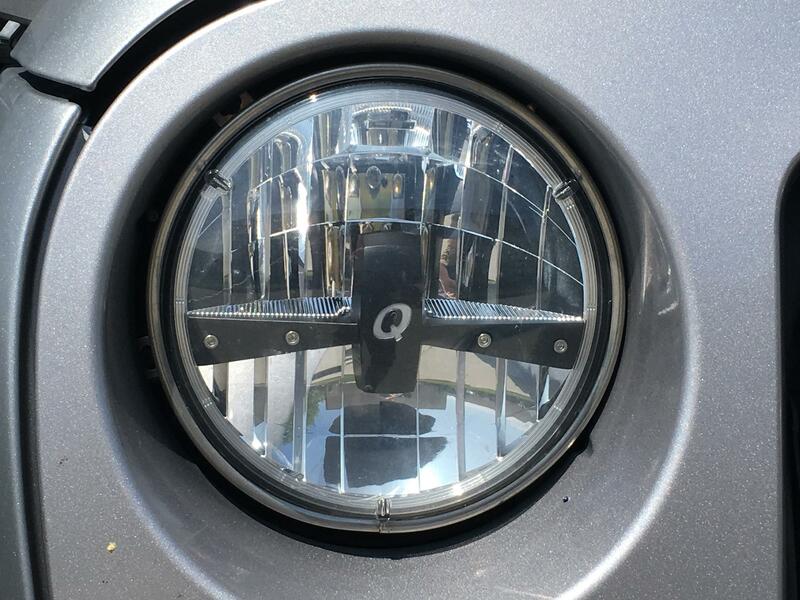 The pair of Quadratec LED headlights now in Grey Wolf throw out 732 lumens, which is nearly a 45% increase in brightness over the previous halogens. This also translates into a 92% increase in illuminating distance. But get this, even though it is a brighter and more intense light, the LED bulbs give off the light equivalency of a 60 watt bulb at only 12 watts of energy output. In short, more light with less power draw on your battery. 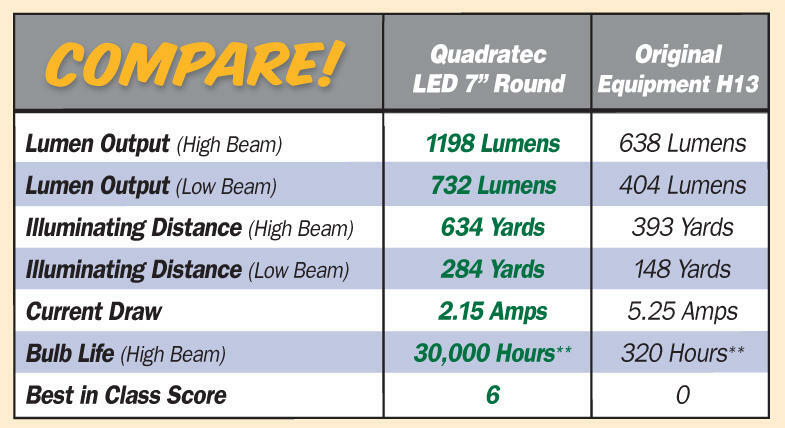 It is also the same with high beams - the Quad LED headlights have a 1198 lumen output vs. the stock halogen's 638. Like we said though, these lights are more than numbers and you will appreciate the extra brilliance just like I do. Installation is fairly straightforward and took about 20-30 minutes. We first removed the grille and trim rings around each light, then unplugged each light from its harness. The Quad LED headlights come with a PWM (pulse width modulator) which is basically an anti-flicker attachment, so one end plugs to the factory harness and the other to the LED light. After tucking in all wiring, we then lined up the three light tabs with the corresponding factory locations and reinstalled along with the trim rings. After we put the grille back on, it just took a minute to make sure both lights were aligned correctly with a couple quick turns of the alignment screws. The Quad LED fog lights are available in amber or clear and I chose the clear ones to install just because our location usually does not get heavy snow or crazy fog. Once in awhile, but not often. You may want the amber fog lights though if those are things you put up with as the amber light offers less glare in those conditions. For my rig, the LED fog lights were a quick installation on the Teraflex bumper and merely involved plugging the harness adapter into the factory harness as well as the lights, then attaching with four Phillips head screws. Those with other aftermarket bumpers with wider spacing on the fog lights may need additional wiring to connect, and if you have the factory bumper then you need to remove the grille as well as the factory air dam. As far as light bars go, admittedly, you may have no need for one - especially if you are strictly an on-road only driver. 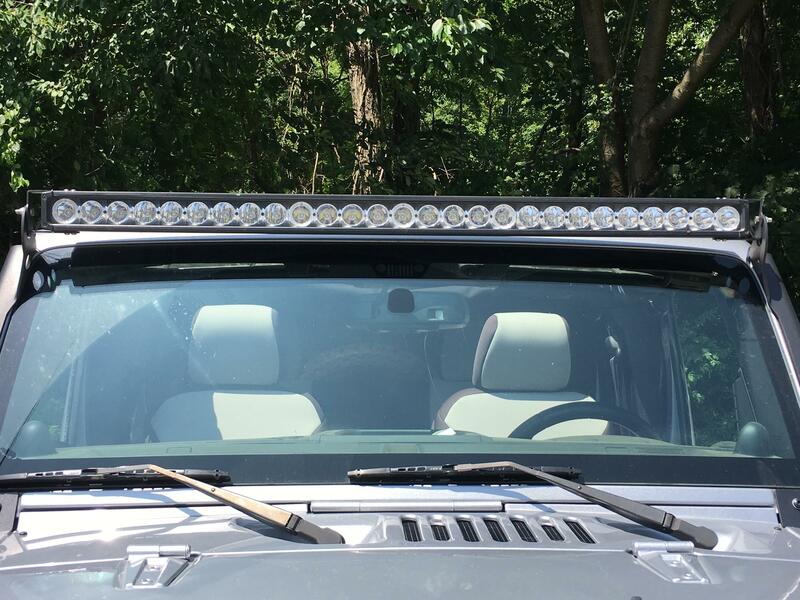 However, I decided to get one of the new Quad J5 Light Bars as we sponsor a few night trail rides during the year and others have them during the summer as well. And the 51" J5 bar throws out 18,000 lumens of light so it is pretty much guaranteed to provide more than enough light. Indeed, on all the runs so far, the performance has been outstanding. I've even used it to flood a potential campsite with light when we arrived late and needed to set up our camp. The bar itself is powered by 27 Cree LEDs, fifteen of which are 10° spot beam and twelve 30° flood beam lamps. We mounted the bar to Quadratec's A Pillar Brackets and fed the wire down through the bracket into the engine bay for installation. We then added Kentrol's Black Stainless Steel Windshield Supports for a clean finishing look. Depending on your vehicle, you may have a different installation method, so be sure to consult our installation instructions. We also have an installation video for those, like me, with a JK.